This letter was written by Capt. 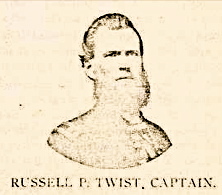 Russell Peter (“R. P.”) Twist (1827-1906) who enlisted in the 16th Ohio Light Artillery in September 1861 as a First Lieutenant. He was promoted to Captain on 17 May 1863, and mustered out at Camp Chase (Ohio) in August 1865. The following summary of Capt. Twist’s war experience come from the History of Wyandotte County Kansas and its people, ed. and comp. by Perl W. Morgan. Chicago (1911). It is probably an account submitted by the family. Twist enlisted in Company E, Sixteenth Ohio Volunteers, April 14, 1861. He served as a sergeant three months, and then recruited the Sixteenth Ohio Battery. Was elected its Captain, and retained command until the close of the war. He was in all the engagements of his command. Was in the battle of Phillipi, and chased the rebels from Bealington to Carrick’s Ford, marching forty miles and wading Cheat River sixteen times in a single day. Battery left Springfield, Ohio, September 5, numbering 106 men; arrived at Cincinnati the same evening. Mustered into United States service the same evening. Left Cincinnati the same evening for St. Louis. Arrived there on the 7th, after many changes, severe marches and much suffering from sickness, fatigue, poor water, short rations, etc. 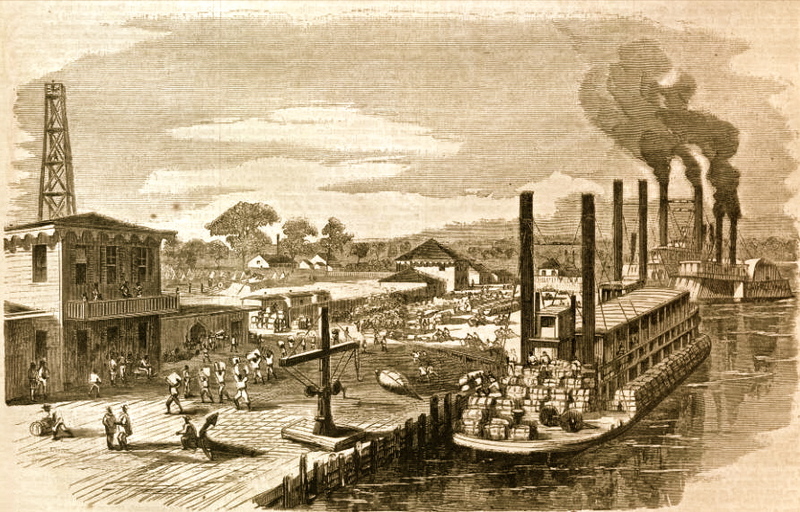 The battery having marched through Missouri and Arkansas, and joined the Army of the Southwest, under command of Gen. Curtis, were in the engagement of Cotton Plant, Ark., where 140 confederates were killed. After two expeditions up White River, the battery embarked at Helena on transport for Milliken’s Bend, April 12, 1863. Joined Gen. Grant’s army and marched through Louisiana; crossed the Mississippi River at Bruinsburg, and by forced marches arrived in time to take part in the battle of Port Gibson. Fought the enemy here the afternoon of their arrival until dark, and as night closed round, the enemy retreated. The battery expended 350 rounds of ammunition in this afternoon’s engagement. His battery was also in the battle of Champion Hill, and finally took position in the rear of Vicksburg May 21, and did good execution through the siege, expending 6,594 rounds, dismounting seven guns, with a loss of but two wounded, and had the honor of throwing the last shot into Vicksburg from the land batteries.They went, after the fall of Vicksburg, to Jackson, Miss., and were under fire five days without loss. They were in active service during the entire war; wore out one set of guns and made considerable use of another set before they were mustered out August 2, 1865. R.P. was the son of Peter Twist (1794-1842) and Kate Beardsley (1795-18xx) who came to Ohio when R. P. was only ten years old. He ran a machine shop at Yellow Springs for six years until he was burned out and then moved to Springfield, Ohio. He was married at Springfield in June 1851 to Nancy (“Nannie”) Evaline Foreman (1833-1875) and together they had at least six children between 1852 and 1867. After Nannie’s death, R. P. married Willahamina Kern and had five more children. Though R. P. appears to have been smitten with New Orleans and devoted most of this letter to persuading his wife to visit him there and possibly relocate in the Mississippi delta after the war, it never happened. R. P. eventually moved to Wyandotte County, Kansas. Camp at Brashear City, La. I have just received your very kind and interesting letter of October 22d and I take pleasure in answering it at my earliest convenience. You can’t tell how glad I was to get this letter for it was the first I had had from you for along time. I don’t think it is your fault that I don’t get letters oftener from you. But we are away from our Division and have been for two months and all our letters go to the Division before they come to us. That makes them about one month behind the time. But this time I succeeded in getting hold of our Division mail and taking our letter out as the mail went through here. So I was fortunate enough to get a large mail and get a good letter direct from you. I was so glad to hear that you were all well. But you did not say a word about coming out to see me this winter. You can’t think how close I watch every train that comes in thinking you may come but am as often disappointed. I have just returned from New orleans where I have been absent for three days on business. I watched every boat that came down thinking I would see you. We are still here at Brashear City and how long we shall remain here it is hard to tell. When we came here, we expected to take the ship for Texas but it was found that heavy draft boats could not come over the bar to get up here this low stage of water. So now they are sending all the army back to New Orleans to take there for Texas and we will go that way I expect now. You don’t know how bad I have wanted you to come out this winter and make me a visit and how much I have regretted that you did not come. We have been idle now so long and it seems a pity that you could not come. Almost all the officers that had wives have had them come to see them and they have had pleasure times and I seem to be the only one that have been denied the privilege. And I have been so situated too that I could not come home for they took my officers away from me so that it has been impossible for me to get any. And then if I could get away, I could not get more than 20 days and I would have to make my connections first rate and was no time to get home and stay one night in that time. And I have bitter enemies that would take advantage of the least thing to have me court martialed. So if I should be absent one day over my time, I might be dismissed from the service. I will not put myself i the power of any scoundrel seeking positions over another’s downfall. They are trying some 100 officers or more for staying home over their allotted time so you see my situation about coming home. I would make any reasonable sacrifice to see you if I could do it honorably, but you would scorn as well as I to submit to dishonor to get to see you. I shall avail myself, rest assured, of the first opportunity to come home. But in the ,meanwhile I shall look very anxiously for you on every arrival. And if you don’t come, I can’t blame myself of not having pled sufficiently with you to come for I have done all I could. I don’t know whether you had better start until you hear further from me or not, if you have not already started. But if you will take courage enough to come on to Texas if you come on here and find me gone, then I would say come on any time. You would be perfectly safe in finding me at any time if you would come to New Orleans and inquire for me at Headquarters of Chief of Artillery or of Major Davidson. They are always there. We may remain here long enough for this to reach you and for you to come and see me here but I can’t tell/ But you would be safe to come at any time this Winter for if I am gone you can easily find that out at New Orleans and follow me for we will not go off of public conveyance this winter. It would cost you some more to come by New York but probably you would feel the safest. I should feel safe in traveling on the river. 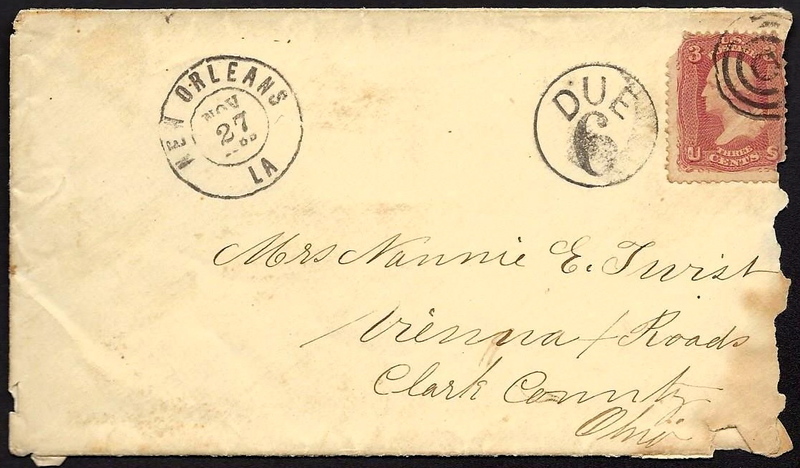 You would always find a letter in the Post Office in Custom House, New Orleans, from me directing you where to find me. But you would find plenty of officers would direct you where to find me. It would be such a comfort to see you and then twould be such an interesting trip for you. I suppose you have the oranges I sent you with Lieut. Dawson and have them all eaten up by this time. I have brought a barrel of them with me from New Orleans — nice sweet ones too. I wish you were here to help me eat them. How well I would like for you to go with me into some of these large fine orange orchards. Oh you would be so delighted down here to see the sights in this pleasant Southern climate and you would be so delighted to spend a few months here. I have entirely fell in love with this country and your consent I expect will be all that will be wanting to make this our future happy home. I don’t like Brashear City at all but I do like this climate and I admire New Orleans the most of any place I was ever in. I think I would like to live there if you would be contented to live there with me. And ’tis just the place — or will be at the end of the war — to make money. And then if you wanted to farm, this is the country to farm in where you can plant fall and spring and let your cattle run to pasture all the year. Do come down while I am here and see this country for yourself and then I will leave it entirely with yourself to say whether we shall live in our Northern home or here where we can have fruit, flowers, and vegetables all the year without hot bed. As I passed over the road and while I was in the city, I saw all their gardens, fresh and nice as in July with us. Nice young radishes, turnips, & onions. Also peas all out in blossom. So were potatoes tops. And all the markets were full of all kinds of fresh vegetables. And then the gay flowers I saw that only bloom in a Southern sun. How I wished I could send you some of the rich and very beautiful bouquets that I saw in the French Market. How you would open your eyes to visit this Great French Market — the greatest and the gayest on the continent. This alone would pay you for your visit here. It seems to me that I can’t give up the idea of your not coming. You need not have no fears of this climate on the account for I believe with the exception of Yellow Fever, tis a healthier place than Springfield and the Yellow Fever is about done for in New Orleans. They have not had one case for the past two summers and scarcely for the past seven years. With proper care, New Orleans can always remain clear of it. All the citizens are the picture of health while up in Arkansas every [one] looked sickly. I talked with men that had lived at New Orleans for 20 to 30 years and never had a day’s sickness. We have not had one man get sick here by fair means. I never had better health than I have had here while I believe if we had of remained up in Arkansas, I should have died. Faithfully & Sincerely, your loving husband, — R. P. Twist, Capt. This entry was posted on Monday, May 26th, 2014 at 1:43 am	and posted in Uncategorized. You can follow any responses to this entry through the RSS 2.0 feed.